I want to start by welcoming all the readers that have come over from Made, where this post is participating in "Celebrate the boy". I only used one skein of "Charisma" by Loops and Threads, a bulky 5 weight acrylic yarn. I chose a thick yarn for warmth, and acrylic for wash-ability. This was my second time using this yarn, I am really happy with the way it turned out and will probably use it again in the future. It is really soft and doesn't itch like some acrylic yarns. I have made this hat using a lighter weight yarn and it works fine, the spaces between stitches are a little larger though. 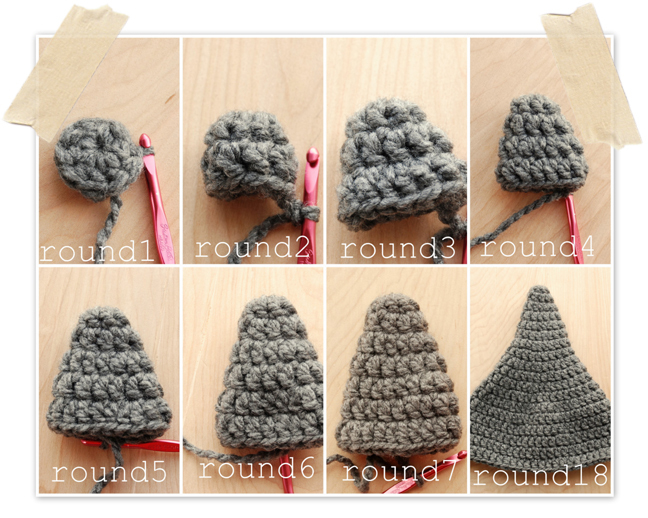 Most of the hat is crocheted in the round and is worked almost entirely using the double crochet stitch. 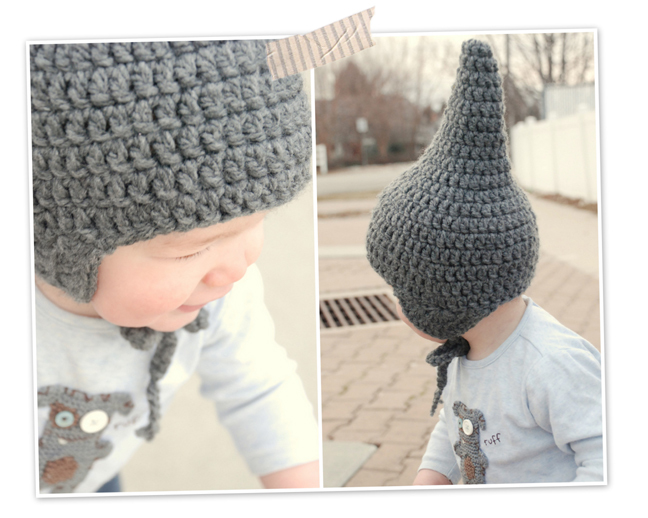 The pattern I am sharing is for a 12month old - 3 yr old size head. The hook I used was US I 9 / 5.50mm. Rnd 1: ch 2 for first dc, 8 dc in ring, sl st to top of beg ch. Rnd 2: ch 2 for first dc, dc in each dc, sl st to top of beg ch. Rnd 3: ch 2 for first dc, dc in 1 dc, *2 dc in 1 dc, dc in next 2 dc, rep from *, sl st to top of beg ch. Rnd 6: same as rnd 2. Rnd 7: same as rnd 3. Rnd 8: same as rnd 2. Rnd 9: same as rnd 3. Rnd 10: same as rnd 2. Rnd 11: same as rnd 3. Rnd 12: same as rnd 2. Rnd 13: same as rnd 3. Rnd 14: same as rnd 2. Rnd 15: same as rnd 2. Rnd 16: same as rnd 2. Rnd 17: same as rnd 2. Rnd 18: same as rnd 2. After round 18 is finished fasten off and thread extra yarn into the hat. To add the first ear flap; Start working in the 10th stitch from the "seam". 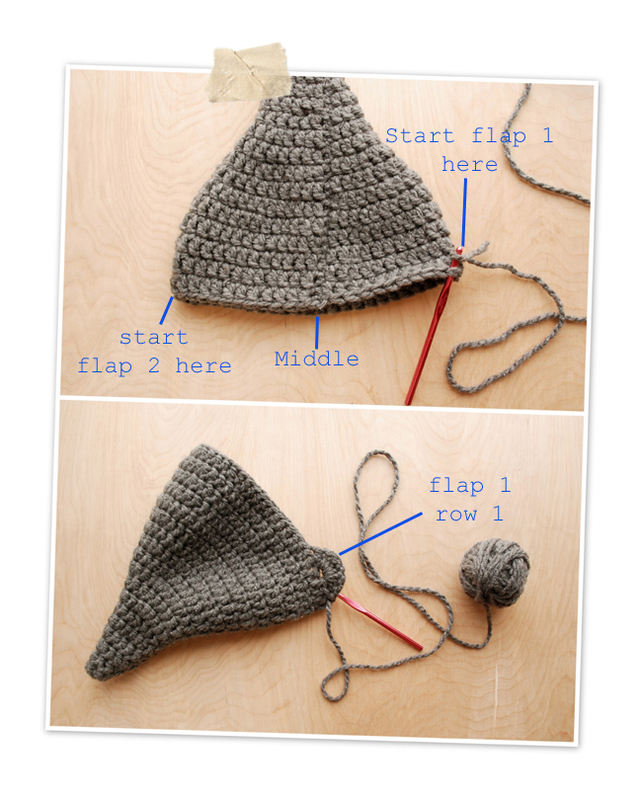 (see top photo above) Work the first row of the flap with the wrong side (inside of the hat) facing you. Flip over and work the next row on top of the row you just made. Work with the right side (outside of the hat) facing you. (working to the left now) 2 dc in every 1 dc (16 stitches total counting ch 3), sk 2, sl st. The "seam" should end up being on the back of the hat. To make the ties cut 2 long strands of yarn. These should be three times longer than the length you want the finished ties to be. Fold a strand in half and loop hook in the center fold of strand. 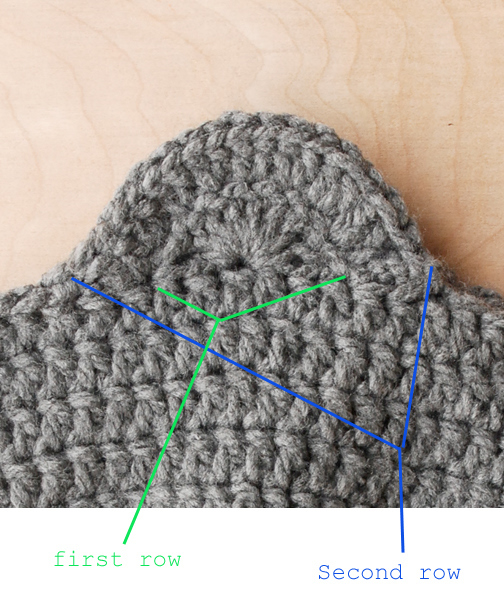 In the middle stitch of the ear flap (see bottom photo above) and pull strand of yarn though stitch. ch as many chain stitches it takes to run out of yarn. (Or as many ch stitches it takes to tie a bow under the chin of the person it is made for.) Fasten off and Trim excess. Do it again on the other flap. You hat should now look like the photo below. Yippee You're done!! 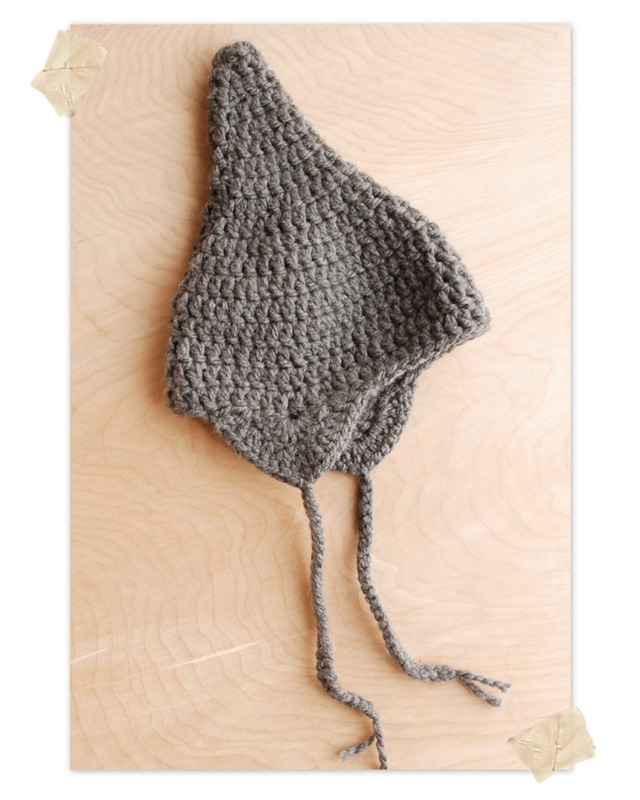 Put it on your little one to keep their little ears and cheeks warm and cozy. If you want you can change it up a bit you can add pom poms or tassels to the ends of the ties. Or you could change the color of yarn every row to make stripes. The possibilities are endless. EDIT: I noticed that I forgot some details in the ear flaps. If you needed some clarifications there just read the red text. I just added it. :) hope that helps. I'm on MADE and see who's on it right now, it's you ! Whoo hoo! I am excited to do this today! Lorajean...you did a wonderful job and the photos are beautiful...of the process, of your sweet son...everything! Thanks so much for the pattern! It's simply adorable and my baby was napping so I decided to start on one right away. Just a question, does round 3 (and subsequent repeats of that round) need to end with a 2dc in 1dc? Thanks again! Makes me want to learn how to crochet! I've been pixie hat obsessed lately. Saw you over on MADE. This is adorable! Thanks everyone for all you lovely comments and thanks Dana for the way too nice introduction on your blog and inviting me to participate! rnd 3 does end with 2 dc in one dc, but each rnd that is increasing like rnd 3 ends with either one or two dc depending on the previous rnd. soo cool soo cute. very easy and clear tutorial. thank you so much. And this is the first time visit your blog (thank to dana MADE!). Ditto--just finding your blog from MADE. Great pattern, and I love your photos! My fam and I just moved from Logan to Japan, so I was excited to see you and Delia are both in Logan. Crazy crafty goodness! Thanks for sharing this! It is super cute. I just might have to make one soon. thanks for sharing the pattern. I can hardly wait to make one of these for my littles. that hat is so funny and cute!!! This is adorable and we just watched Gnomeo and juliette V-day wkend this will be a great surprise for my little girl who couldn't stop talking about the movie. Thank you. too too cute!!!! 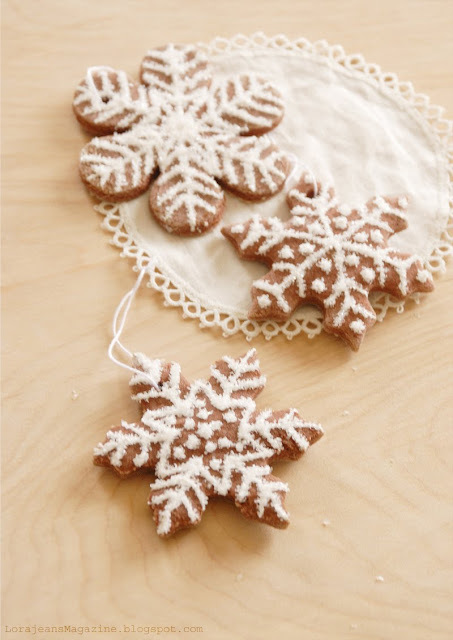 i am so gonna make this!!!! Oh my gosh! This is so cute! I love the whole outfit! So stinkin' cute! Is there a pattern for the dog on the shirt? I'm already working on a hat for my little man. Never mind that it's too warm now for it, it will fit next year too. Hey...I am going to link to you. I just made one. I don't think I have perfected the flaps as nicely as yours, but the rest was such a cinch. Thanks for the great pattern! haha! i heart this! buuuttttt, what do i have to add to make one for ME? I love this pattern! The hat was super easy, but the ear flaps have me stumped. If you are having problems with the ear flaps It's probably because I failed to point out that when you start each flap row you work th the RIGHT first instead of to the left like usual. After you ch 3, you sk 2 dc, sl st, to the RIGHT. Flip over and, working to the RIGHT again, sk 2 dc and sl st.
Now ,working to the left now, stitch 2 dc into each of the 8 stitches you just made. sk 2 dc , sl st. fasten off and you're done! :) Hope this helps! Thank you, Lorajean! That's exactly what I did last night after I commented, and it worked perfectly! My daughter looked adorable when I tried it on her this morning! Love it! Made one for my 13 year old to wear to the basketball game! It was a huge hit! I used 2 strands of yarn, and a K hook. Came out perfect just as written. I did not do the ear flaps. Great pattern and thank you for sharing it! Thanks for this pattern, I love it so much! I made one and can't wait to make more. Although I didn't have any babies handy to model my hat, so I put it on my cat for now, haha. Wow, I am *so* impressed! I love to crochet but I haven't done it in years because honestly I didn't think there was anything that I could make that I would actually use in real life. i stand corrected. I would totally make this hat! Thanks for the awesome tutorial, and for the pictures. Very awesome. I loved your simple pattern. I created my boy a hat making up a pattern based on yours. I hope you don't mind that I have included a link to your site on my post about this hat! Thanks for sharing. I love to crochet and I know all the stitches and can make just about anything. The problem is I can't read patterns... I get really confused and don't understand the instructions. I have made lots of things just out of my head! Can anyone recommend where I can learn to read patterns? I learned to crochet when I was little and have never stopped... I don't know some of the formal names for the stiches I can make. 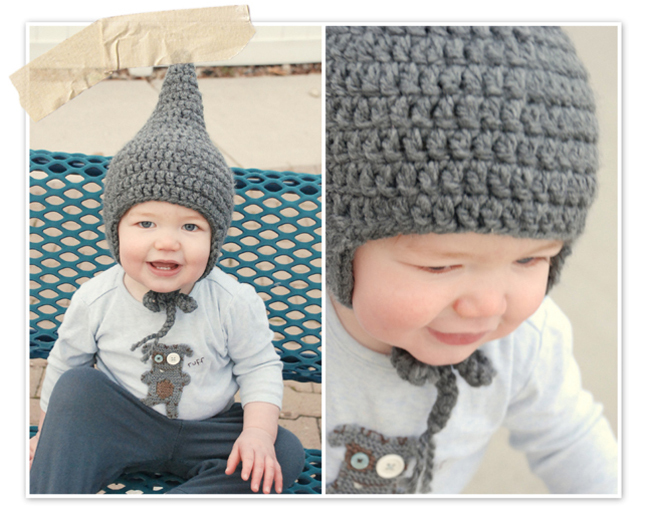 It is frustrating because there are so many cool patterns out there that I would love to try... like this adorable gnome hat! Thanks for the help! I just made this lovely little Gnome hat for my BFF's bambino! Such an easy pattern, it came off the hook in no time! Unfortunately, the little bean is still cooking away so I don't have a model for the hat, but here's a photo! Thanks so much Lorajean for such a fantastic, easy pattern. I've gotten 6 requests for more already!! i love this pattern so much!! any ideas on how to make it for a newborn...smaller hook, less rounds? thanks!! What a great tutorial and what a great sight. Love the photos and the detailed process...Thank you!!! pop over to my blog in a few moths time to see if they ever eventuated. i hope they do! Thank you so much for the pattern! I made it for my 3 year-old son, at first he did not want. Now it's one of his favorites and gets lots of compliments when we are out and about. 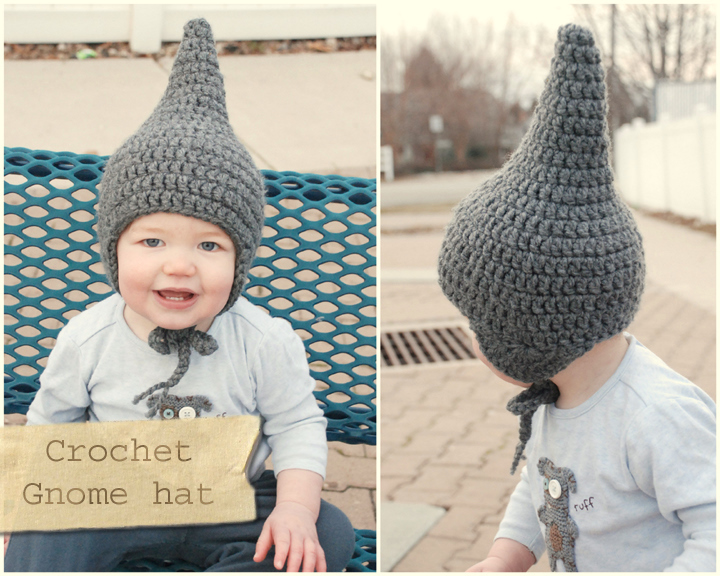 I really want to make one for my 3 month old. How would I change the pattern so it's smaller? 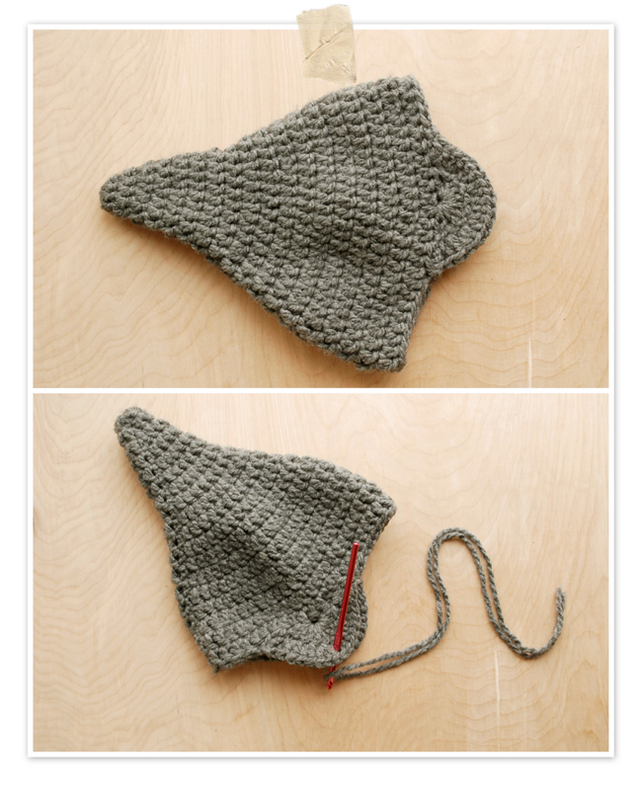 If you use a smaller yarn an hook that will get you a smaller hat. don't go too small or you will make a dolls size hat so I would suggest only going down one size in yarn and one or two sizes in you hook. Love it. I followed the pattern, but my hat came out newborn sized, even though I used a K hook, and two strands of bulky yarn. That's okay though, I am a newborn photographer so I will just save that for a little one. I am wondering though, what I did wrong. I need it to fit a 3yr old, and even though I know I did it right, somehow its not big enough. I crochet loose so things stretch a little for comfort, but it still wasn't enough. Should I just keep going with rows 2 and 3 until its the right size then work out the other steps? I love this pattern and will be making more. :D Thank you SO much for sharing this lovely pattern. Hello Lorajean! I've made two of these, one in a preemie size and the other for a two year old. I wanted to share photos with you, but alas, I cannot because I do not have outlook to see your email address. Anywho, I will post the items I have made on my website and link back to your page. :) Thanks for sharing this sweet pattern. Thanks so much for sharing your creative pattern. I just whipped this up in a little over an hour. It came out so cute. Thanks again!